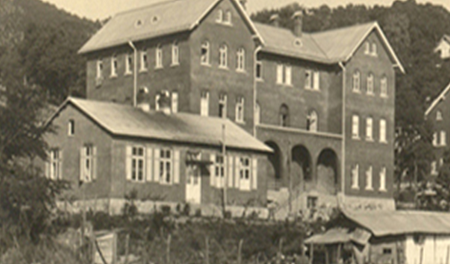 In the year 1923 Abbot-Bishop Bonifaz Sauer, OSB, of Dokwon Abbey, Korea, came to the Mother House in Tutzing and petitioned to mission Sisters to Korea. In response to the invitation, on November 21, 1925, the first four Sisters from Tutzing arrived in Wonsan, Korea. Then Sisters served in parishes, educated the young at Sunday schools and elementary schools, and provided health-care and social services. In particular, Sisters took special care to meet with women and shared with them the Good News as then women were culturally excluded from the general circle of associations where men were present. On the night of their arrival in Korea, their first four candidates greeted the first four Sisters, and, in the very night, the sisters interviewed their first four candidates. On June 6, 1927, the community in Wonsan became a priory and began its novitiate, and, on May 24, 1931, the first six novices made their first profession. 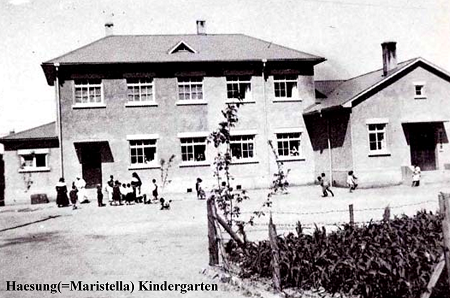 Until the Priory was dissolved, the Sisters served in parishes, managed a Haesung (the Star of the Sea) kindergarten, clinics and dispensaries, and free-of-charge elementary schools for poor children. After the Second World War, Soviet Union occupied the northern part of Korea, and in 1948 Democratic People’s Republic of Korea was born. Soon thereafter, the communist government began its policy against religion, and in May 1949 Wonsan Priory was dissolved. Then, the priory had 45 Sisters (25 Korean Sisters, 19 German Sisters, and 1 French Sister). Korean Sisters were forced to disperse, while the European Sisters were imprisoned and then had to suffer almost 5 years at a forced labor camp in Oksadok. At the forced labor camp 2 German sisters died, the communist government shot to death one Korean Sister, and Oblate Sr. Agneta Chang was killed in a prison in Hamheung. 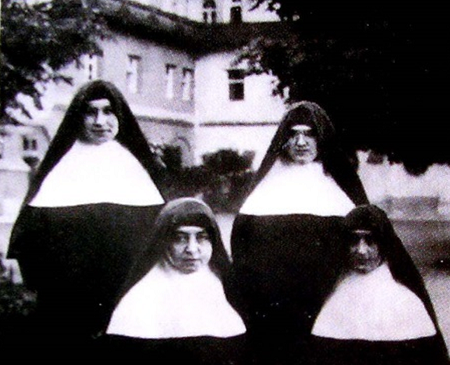 Today the 3 Sisters and 1 Oblate are among the 38 martyrs being petitioned for beatification. In addition, 3 final professed Sisters and 3 junior Sisters are still missing! In January 1954, the 18 surviving European Sisters were sent back to Tutzing. When 10 of the 18 Sisters regained sufficient health, they returned to join the Korean Sisters established in the meantime in South Korea. Again, the 10 Sisters devoted themselves for the growth and development of the Sisters in Korea. During the Korean War (June 25, 1950 – July 23, 1953), most of the Korean Sisters dispersed in 1949 made their way to South Korea. Though they fled without knowing whereabouts of the others, on December 9, 1950, they all arrived at a refugee camp at Jungang Parish in Busan and there they found each other, as though they had agreed beforehand! Since then December 9, 1950, has become the date of the new start in the south. In total, 17 Korean Sisters escaped from the North. Benefactors came to support the refugee Sisters. Sisters themselves did different work to support themselves, their fellow refugees, and their mission. Sisters did nursing in the army hospital, and did sewing and other chores to make living. Yet, the Sisters shared whatever they could with other equally struggling refugees. The refugee days after the dissolution of the priory and during and after the war gave the Sisters indescribable hardships. At the same time, all the hardships and sufferings Sisters had to undergo during those months and years became the potent force and source for the future development of the Sisters. Sr. Otmara Ammann from the neutral state of Switzerland had been a member of the community in Wonsan (1928 – 1935). Deeply moved by the incredible news about the miraculous new beginning of the Korean refugee Sisters Motherhouse appointed Sr. Otmara to serve as their superior; in October 1951 Sr. Otmara arrived in Busan. While struggling for day-to-day survival, the refugee Sisters also dreamt dreams and searched a way to make another new leap. The call came from Daegu. Bishop John Choi invited our Sisters to his diocese. Within the compound of the diocesan offices Bishop John readied a house for the sisters and Sr. Otmara and the sisters moved to their new home in October 1951. For a more stable long-term development and for a novitiate, already in 1952, Sisters acquired a house in Gongpyeong-dong. The community in Gongpyeong-dong, Daegu, became the first canonical station. For sure, the house was small even for the community. 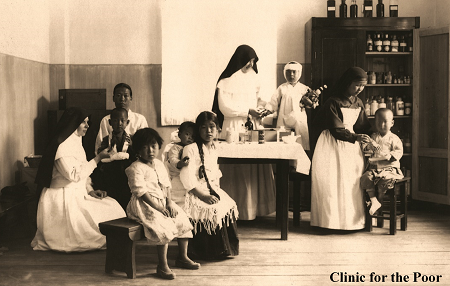 Yet, the sisters took the largest room of the house and opened a free clinics for the poor, St. Antonio Clinic! Eventually St. Antonio Clinic became our rice seedbed and gave birth to all our health care endeavors including two general hospitals, Daegu Fatima and Changwon Fatima today. God’s blessing and support of the people at home and abroad continued. On June 21, 1955, Sisters dedicated a second local station in Sinam-dong and the first Fatima Clinic within the compound. On July 29, 1956, the local station in Sinam-dong was raised to become St. Benedict Priory, Sr. Otmara was appointed to be the prioress, and the novitiate was established. On December 8, 1958, for the first time in South Korea, 4 novices made their first profession. Sisters sent back to Germany also returned to join the Korean Sisters. After the indescribable years of suffering, now reunited and newborn, the community stood firm and appreciated the God-given new start in the south. Then the community grew and Fatima hospital flourished. Furthermore, the city grew and encroached on the community and the apostolate of the Sisters. Finally, the Sisters decided that the priory would need a more suitable location for the life of a monastic community, and the hospital would appreciate the space of the priory house for its further development. The search was on. 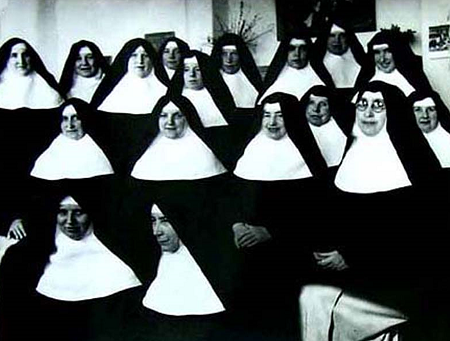 In 1987, St. Benedict Priory in Korea had 273 Sisters. On November 16, 1987, a new priory dedicated to St. Gertrud was born in Korea. Of St. Benedict Priory 72 Sisters became members of St. Gertrud Priory whose priory house was readied in Seoul, Korea, and 201 Sisters of St. Benedict Priory in Korea became members of St. Benedict Priory in Daegu. 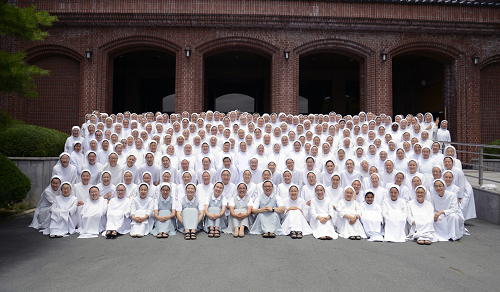 Today, in 2015, St. Benedict Priory in Daegu numbers 351 professed Sisters (330 final professed Sisters and 21 temporary professed Sisters). Today the Sisters of St. Benedict Priory endeavor in 34 local stations (32 stations in Korea and 2 stations in 2 foreign countries). 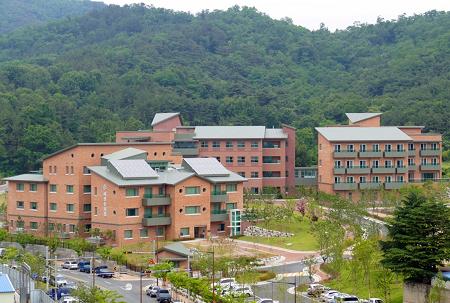 The apostolates of St. Benedict Priory in Daegu include parish ministries (33), health care services (2), education (early childhood (9), middle and high school (2), special education (1)), Bible studies (7)), social services (5), retreat houses (2), special outside apostolates (e.g., assignments in the diocesan offices), and services within the community (e.g., the apostolate of prayers of the infirm and elderly Sisters). Our admirable exemplar sisters, courageous missionaries, and elderly sisters with years of dedication and self-sacrifice are our most precious assets. Following their exemplary lives, we live in our times. With the many challenges of our times, we prepare for the future and through the spirituality of St. Benedict we endeavor to plant gospel values in our modern times. Most of the religious communities in the western world had gone through their time of rapid decline in religious vocation and concomitant rapid rise in their average age. In recent years, similar phenomena are taking place also here in Korea, and our priory has not been an exception. Accordingly, we have been trying to understand the phenomenon and to meet the invitation and the challenge. Most recently, after a long consideration and planning we have constructed a number of buildings next to the priory house. Fatima Home is a retirement home for elderly and St. Scholastica House is for our elderly sisters; our Haesung kindergarten now has a new building for 10 classes; for adult faith and cultural formation, we have St. Benedict Education Center for adults where we would pursue Bible studies, faith building activities, and cultural formation programs. Though inchoate but full of hope a number of our sisters have been also looking into the ecological spirituality. Within the boundary of our priory house, we cultivate a good size farmland. Here we try our best to practice ecological agriculture and we have been enjoying eco-friendly products. For some years, we have been raising sufficient number of eco-friendly potatoes and heads of Chinese cabbages for our communities. We have been also raising eco-friendly medicinal herbs for our own consumption, for gift giving, and for sail. We also try to support eco-friendly products available on the market. God looked at everything he had made and found it very good (Genesis 1: 31).